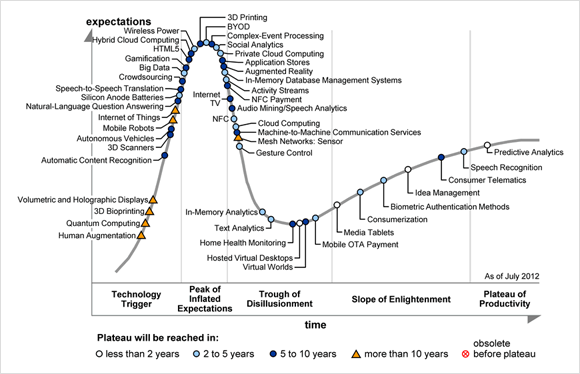 Worley says one of the major pain points for the market right now is the slow adoption of NFC in mobile phones, but if the newest edition of the annual Gartner Hype Cycle report is correct, NFC technology is at the end of its hype and is now experiencing the “Trough of Disillusionment” on its way to the “Slope of Enlightenment.” Dan Rowinski at ReadWriteWeb took a look a the report results and the estimation that NFC will reach ubiquity, or the “Plateau of Productivity,” within 2 to 5 years. Between Q2 2011 and Q2 2012, website traffic from smartphones increased 103%. iPhone continues to dominate Android: in Q2 2012, iPhone had a 5.41% share of total website traffic versus 3.31% for Android. The top three shopping activities involving smartphones were taking a photo of a product (37% of users did this), searching for a store (35%), and researching products and prices (35%). 1 out of 3 smartphone users shares their location. According to Invodo research, mobile shoppers are three times more likely to click and view the video than desktop or laptop users. Internet Retailer reports that those that view a video are 144% more likely to place that item in a shopping cart. And, 52% say that watching the video makes them more confident about their purchasing decisions (read: fewer returns).